Discussion in 'Frequently Asked Questions' started by lil black liberty, Mar 18, 2010. And I can't remember what I gapped my other set of Autolites....Any thoughts on what it should be? Check under the hood i think its like .45 but check under the hood it will tell you!! Look at your emissions sticker that is on the upper radiator support,it will tell you the correct plug gap for your year. But don't you want to use what the plugs says for gap? And use what the sticker says when using the same oem plug? I would think that not all plugs are the same and a different gap may be needed depending on the plug. 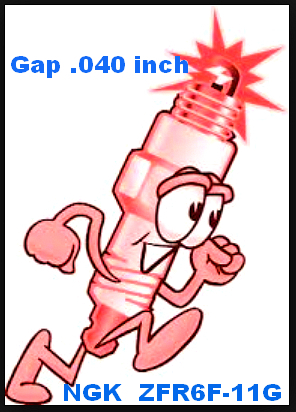 The correct gap for any plug you may put in the 3.7 is the gap stated on your emission sticker on the radiator support. I pulled my OEM NGK copper core plugs at right around 30,000 miles and the gaps were way off (opened up and worn) so I replaced them. Since you just got the jeep, good thing to change all the fluids and plugs and start fresh like you said anyway. Yupers, Changed the plugs today and it had Autolite Single platniums :icon_biggrin: They looked like they were changed not too long ago, 2 had .045 and the rest were at about .040. Changed them anyway and made sure to put anti-seize on them. Now to find out what oil people recomend for the front and rear diffs. I own a 2002 Jeep Liberty LTD, 64,000 miles (read and weep) work overseas A LOT. Truck is in mint condition and was going to change the spark plugs. So when I "googled" for help was sent here...don't know if this is the page for this make model of Jeep, but this POST is for Liberty's (3.7 litre V6's) in particular. 1St, called NGK and asked~~~DUH? BE VERY CAREFUL IF YOU OVER SIZE YOUR PLUG, MEANING BENDING TOO FAR OVER THE METAL PLATE. DO NOT PUT ANYTHING IN BETWEEN THE IRIDIUM CONTACT AND THE METAL PLATE AS IT WILL CRUSH THE IRIDIUM CONTACT. THESE ARE MUCH MORE DELICATE THAN PREVIOUS TYPES OF SPARK PLUGS. BE VERY CAREFUL. TAKE YOUR TIME. So hope this helps some people out there with their spark plug gap questions, remember...when in doubt call the manufacturers. DO NOT waste your money on NGK Iridium IX platinum spark plugs. Yup, Tom knows his stuff. Here is my cartoon moment, of my Jeep Running Great! LONGJEEPOWNER and LibertyTC like this.